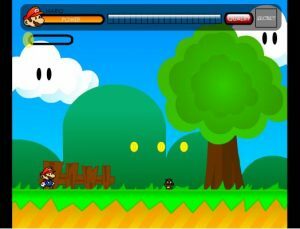 Your goal in this Mario platform action game is to complete each little level. Use your arrow keys to jump and run and press space to use your hammer to crunch the enemies. Use your hammer to crush enemies or do it in the traditional way, jump on them. If you defeated all the enemies you will be rewarded with a password for an extra mode. Use the ARROW KEYS to move around, press SPACEBAR to use hammer. Have fun!